You can edit a group at any time to add learners to or remove learners from the group. You can edit both manually created groups and smart groups. In the Users and Permissions menu , click the Manage Groups link . On the Groups page, click the name of the group. You can edit both manually created groups  and smart groups . Note: The All Learners smart group cannot be edited. Edit the manually created group as necessary. To edit the group name, click the name of the group . You can also find users to add to your group  and remove users from your group . Changes to manually created groups are saved automatically. To view content that has been assigned to a group, click the Relevant Content tab . Content items such as courses, programs, live trainings, and categories will display in this tab. To remove a content item, click the Remove icon . To add a content item, click the Add Content button . To search for content, type a search term in the Content Title search field . Click the content title in the search results . Required : the group learners are enrolled in the course and the course is marked as required in their Learning page. 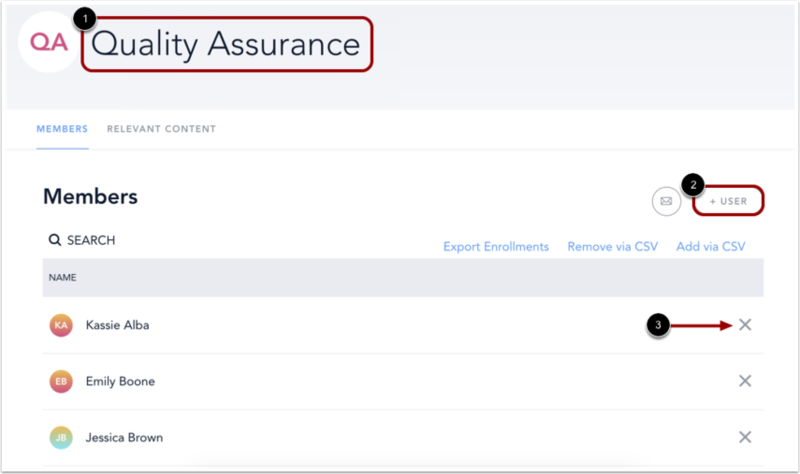 Recommended : the group learners can view the course in the Recommended by [Your Organization] section of their Learning page. Available in Library : the course displays in the Learning Library for all members of the group. To save your content selection and relevance, click the Save button . To search for a category, type the category name in the Content Title search field . Categories are represented in the search results by the stacked squares icon . Click the category name in the search results . In the Set Relevance drop-down menu, set the relevance for the group to Available in Library . The only available relevance setting displayed for categories is Available in Library. To save your category selection, click the Save button . 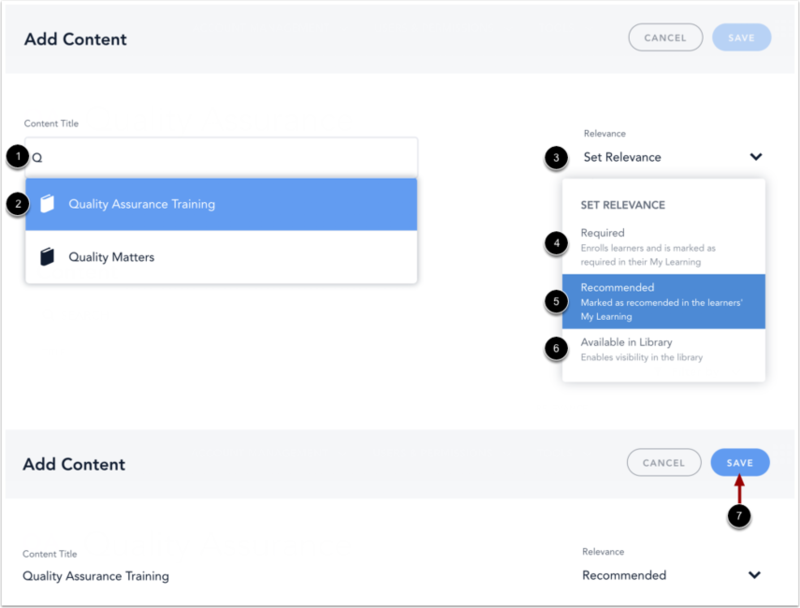 Once a category is assigned to a group, all the category's learning content will display in group members' Learning Library within the category row. Edit the smart group as necessary. To edit the group name, click the name of the group . 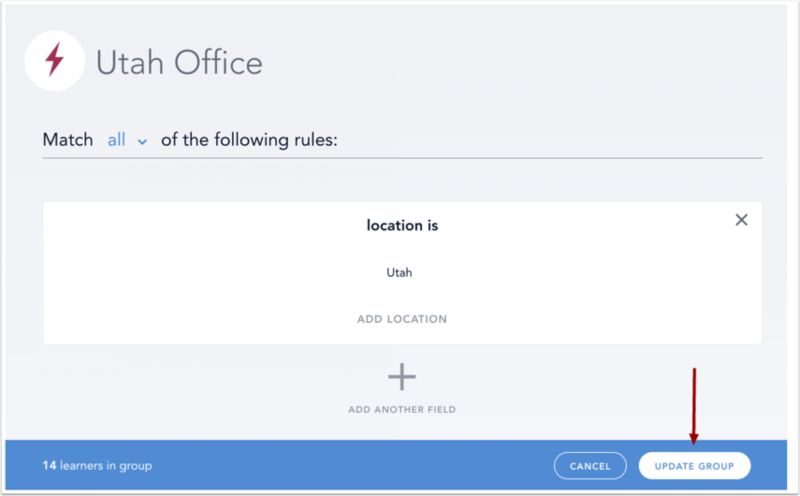 You can also edit or delete existing rules . To add a new rule, click the Add Another Field link . To add or remove a user, you must edit the rule(s) of the smart group. 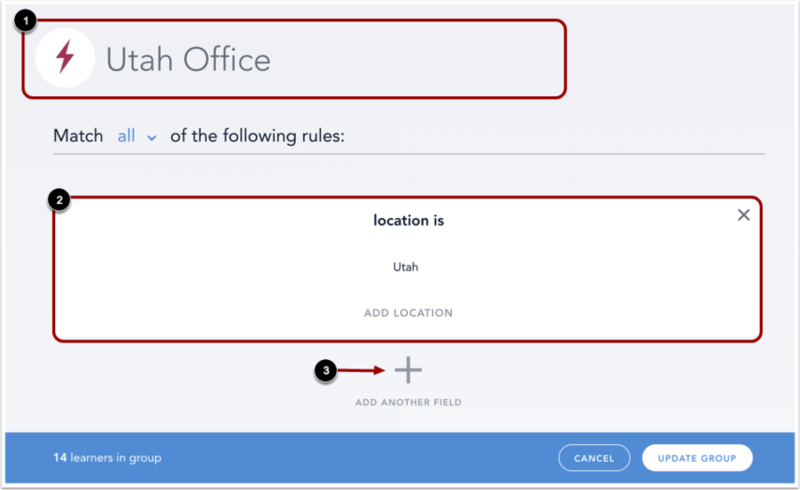 Users need to meet any or all of the rule attributes in order to be added to the smart group. Once you have made changes, click the Update Group button. Previous Topic:How do I create a smart group? Next Topic:How do I send a message to a group? Table of Contents > Manage Groups > How do I edit a group? How do I add a category to a learning content item? How do I create and manage categories in my account?